One, I guess because it is winter, the resin was not nearly tacky enough to hold together the ceramic any earlier than 2 hours, so I increased the wait time. 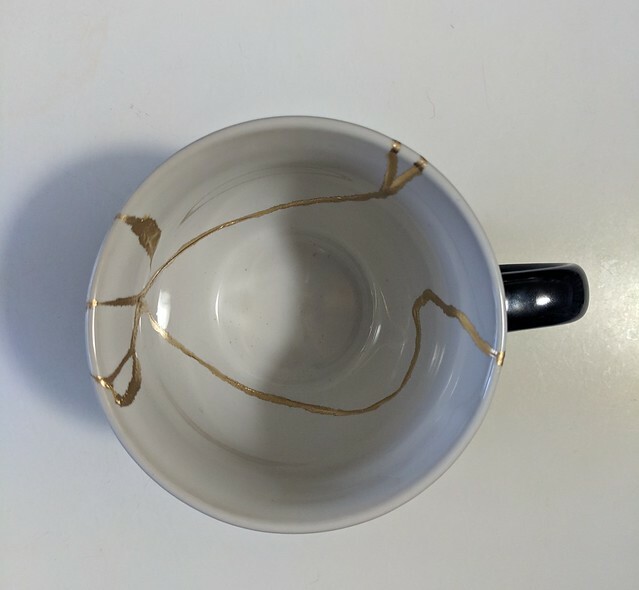 Two, I bought some 24k gold dust for the final dusting, instead of using food coloring. I think it really makes an incredible difference. And 24k gold is food safe, and and 5 grams of it cost the same as 5 grams of the food coloring dust he recommended, so I didn’t really see any reason not to use it? 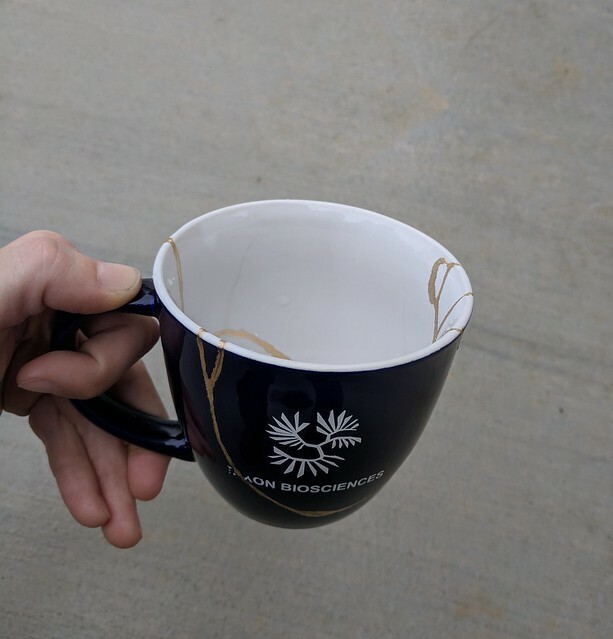 I guess if you want to microwave it, but honestly the look of the real gold is so superior that I’m willing to sacrifice microwavability. 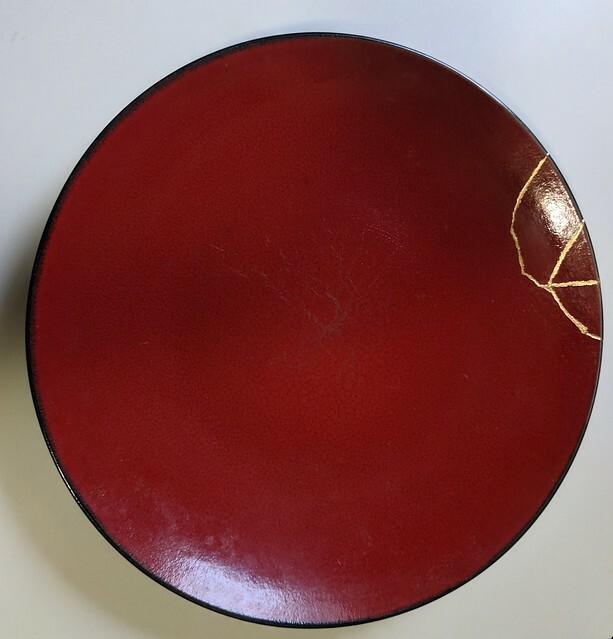 I will also add that, adding coloring to the binding resin seemed useless, as the final coat painted on top is totally opaque? I did that anyway, but couldn’t figure out why it was suggested. It seemed like it just made cleanup the next day more difficult and everything more messy in general. 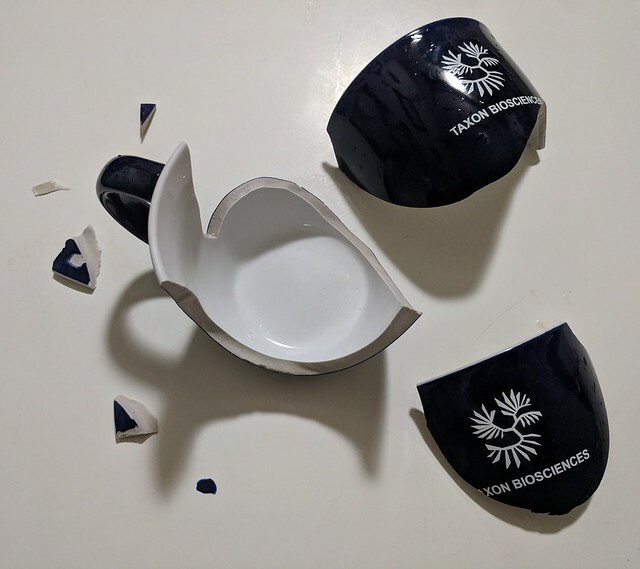 While I was practicing on the plates, I accidentally dropped my work mug (whilst at work). 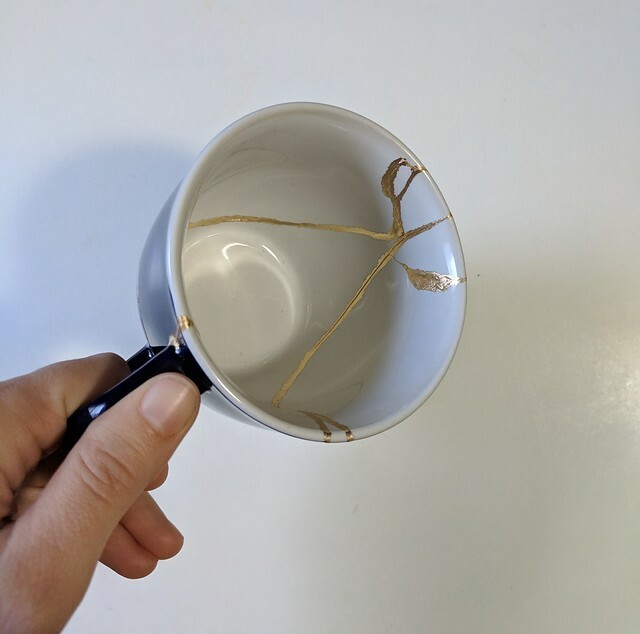 I was scooping up all the shards and throwing them away, when I realized that maybe it would be a good project to try “kintsugi-ing” that mug as well. 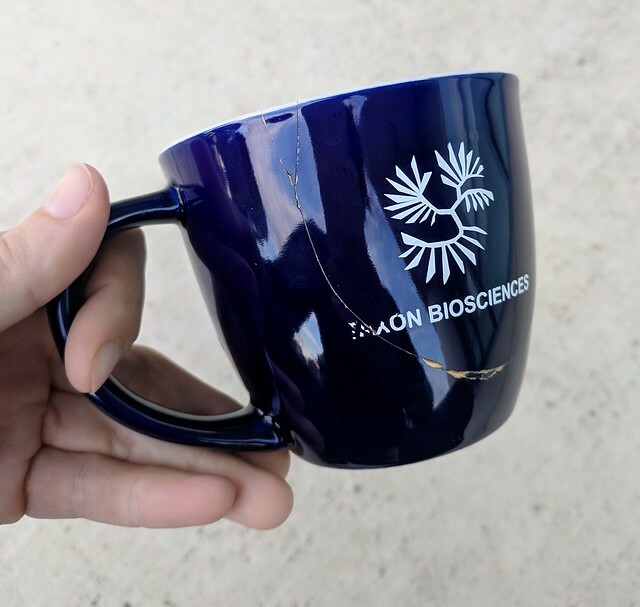 My employer had recently been acquired by a larger company, and they are now closing our site. 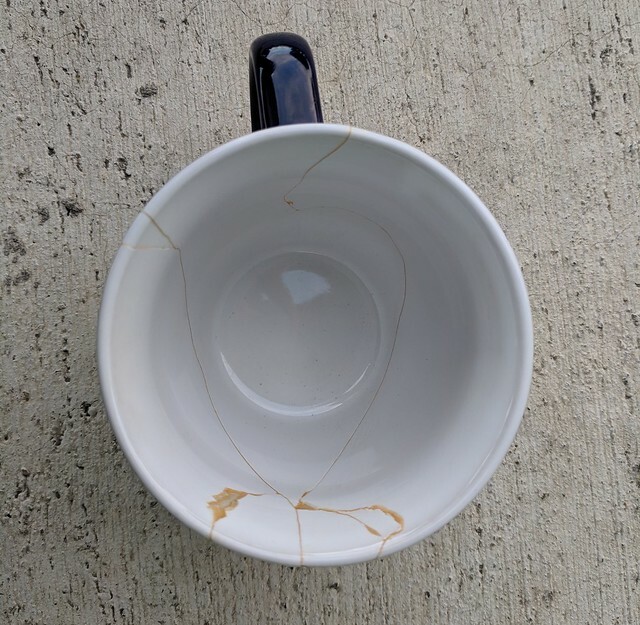 I had thought that I’d keep the mug as a souvenir of all the trials and tribulations, and since the idea of wabi-sabi is that a thing is more beautiful for the life it has lived and its wear and breaks are a part of its history and aesthetic, I thought that was a healthy attitude to apply to this situation. 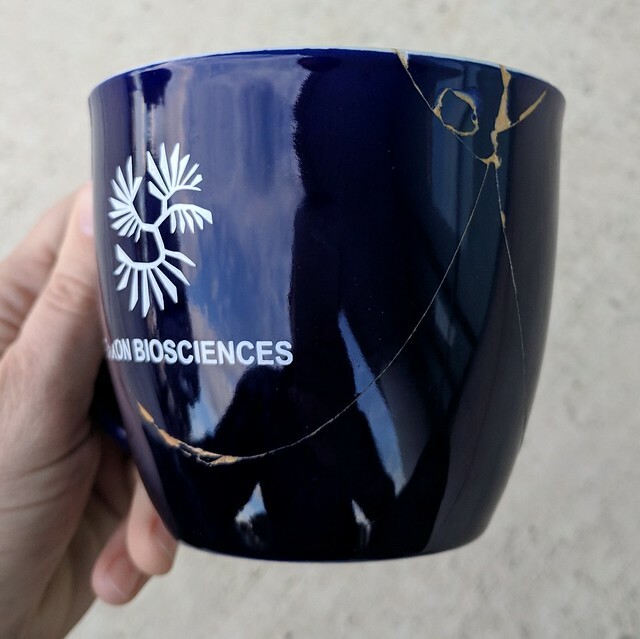 So, yeah, it is a cheap corporate mug, but the process in this case was largely a symbolic one. 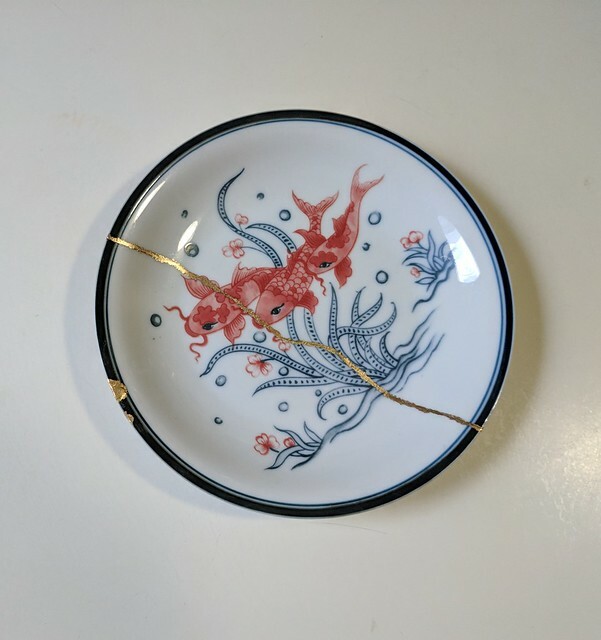 This entry was posted in Art, Personal and tagged kintsugi, personal, wabi-sabi. Bookmark the permalink.